Redcon1 TANGO is what the company coins as a ‘Creatine Formula’, and there you go, asking why does the world need another creatine supplement? Well deserved! The thing is with TANGO it is a bit different than your average 5g of monohydrate. TANGO mixes in Creatine with other well researched ingredients all working together to create that ATP production increase and cell volume that will drive in turn, accelerated protein synthesis. Yeah, that is a mouthful! Lets dive into the label & talk about what you can expect. As always if too much science talk puts you to sleep you can skip to the ‘Label Bottom Line’! Creatine HCI – 1g – before you go off saying 1G!! WTH? not all creatine were created equal. The main difference between different types of Creatine you’ll see out there is their solubility. and HCI is the best out there, up to 38 times more soluble than MONO. Which means you need less Gs to be way more effective. 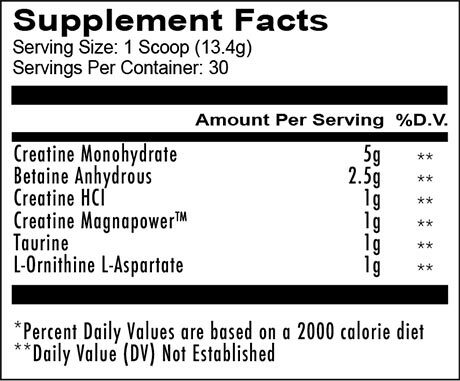 L-Ornithine – 1g – another non essential amino acid that reduces ammonia concentrations in the blood. Taste & Mixability: 2 flavors at day of launch for TANGO. Just like all the other RedCon1 products we tried, flavor is solid and mixability is flawless. Effectiveness: Well, if you like creatine, you’re gonna LOVE TANGO. It is like creatine on PED…everything just feels MORE. more strength, more endurance, more muscle volume. The feeling on Tango reminded us very much how we felt with USPLabs Modern Creatine and KAGED Muscle – Creatine HCI. TANGO Launches at $34.99 for 30 servings. With Creatine being probably the cheapest & most effective supplement you can buy (we regularly hunt down deals on 50 servings of 5g Micronized Monohydrate for less than $10) then this is quite a jump. Even, when compared to the other Super Creatine products out there this is still on the high side, unless you compare it to the new GHOST SIZE and bpi Sports Modern Creatine which are also at the $30+ range. So, you do want to consider the value you get with more performance enhancing ingredients. The good news is that you can always compare prices & find the best deals & coupons for RedCon1 TANGO by checking out our deal alerts and comparing prices on our site! Not sure which creatine supplement is right for you, check out our best 10 creatine supplements for 2017. SEE THE HOTTEST CREATINE SUPPLEMENTS DEALS FROM AROUND THE WEB!